New York City emerged on Sunday from a massive blizzard that paralyzed much of the US East Coast, while snowy gridlock gripped the nation's capital and surrounding areas, where federal, state and local offices and schools planned to remain closed on Monday. Midtown Manhattan sprang back to life on a bright and sunny Sunday as residents and tourists rejoiced in the warming sunlight, digging out buried cars, heading to Broadway shows and cavorting in massive drifts left by New York City's second-biggest snowstorm in history. In Washington, where a traffic ban was still in effect, the recovery got off to a slower start, with the entire transit system closed through Sunday. The Office of Personnel Management said federal government offices in the Washington area will be closed on Monday, along with state and local government offices and schools. Even so, many people were out in the street. Some skied and snowboarded down the steps of the Lincoln Memorial until security officials moved them on. The entire region seemed to breathe a sigh of relief after what was unofficially known as Winter Storm Jonas left at least 20 dead in several states. "For us, snow is like a normal winter," said Viola Rogacka, 21, a fashion model from Poland, walking with a friend through New York's Times Square. "It's how it should look like." Theater shows reopened on Broadway after the blizzard forced them to go dark on Saturday on the recommendation of New York Mayor Bill de Blasio. "We still have some areas that we have to do a lot more work on. But we've come through it pretty well," de Blasio said on ABC's "This Week." "I think tomorrow is going to be pretty good. We think we'll be broadly up and running again at the city tomorrow." The blizzard was the second-biggest snowstorm in New York City history, with 26.8 inches (68 cm) of snow in Central Park by midnight on Saturday, just shy of the record 26.9 inches (68.3 cm) set in 2006, the National Weather Service said. Thirteen people were killed in weather-related car crashes in Arkansas, North Carolina, Kentucky, Ohio, Tennessee and Virginia on Saturday. One person died in Maryland and three in New York while shoveling snow. Two died of hypothermia in Virginia, and one from carbon monoxide poisoning in Pennsylvania, officials said. Reinsurer Munich Re said it was too early to estimate losses from the storm. New York state Governor Andrew Cuomo lifted a travel ban on New York City-area roads and on Long Island at 7 a.m. (1200 GMT) on Sunday. A state of emergency declared by Cuomo was still in place. Most bus and subway services operated by the Metropolitan Transportation Authority were up and running again by 9 a.m. (1400 GMT), officials said. The agency was working on restoring full service on Sunday. The Metro-North rail line, which serves suburbs north and east of New York City, was restored on Sunday afternoon and was operating on a Sunday schedule. Service remained suspended on the Long Island Rail Road. Commuters who rely on the Long Island Rail Road to get to work on Monday may need to look for alternatives as the railroad works to restore service. Crews were working on Sunday to remove snow from an intersection near train tunnels to Manhattan. A spokeswoman for the New York Stock Exchange said the market planned to open as usual on Monday. City schools also were set to open on Monday. On the Upper West Side of Manhattan, grocery store shoppers picked their way through brown slush and over compressed snow and ice as they balanced their bags in their hands. Drivers tried their best to free cars that were encased in snow, but often found themselves spinning their wheels as they tried to get on the road. Outside the city, suburban New Jersey resembled Vermont. "I'm not sure where I am right now because of all the snow," said Patty Orsini, 56, a marketing analyst from Maplewood, New Jersey, at the nearby South Mountain Reservation. "It's nice to be out today in the sun. Yesterday it was scary to be outside," she said as she clipped on her cross-country skis. The National Weather Service said 22.4 inches (57 cm) fell in Washington at the National Zoo, and Baltimore-Washington International Airport notched a record 29.2 inches (74.2 cm). The deepest regional total was 42 inches (106.7 cm) at Glengarry, West Virginia. 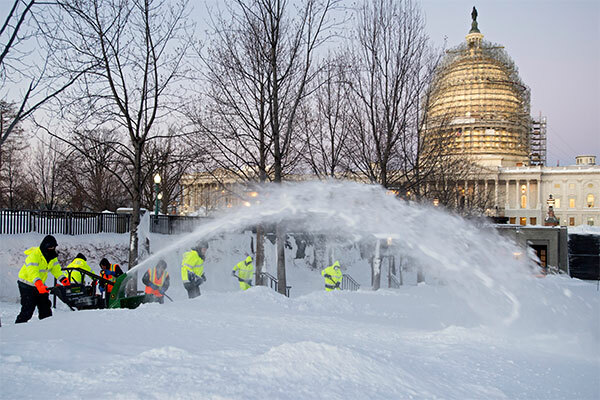 Washington, which has a poor track record in dealing with snow, seemed unready for a return to its Monday routine after its largest snowstorm in decades, with major airports, public buses and subways completely shut down all Sunday. Metro trains will begin limited service starting at 7 a.m. on Monday. Washington Mayor Muriel Bowser earlier issued a public apology for commuting headaches caused by the blizzard, which locals dubbed "Snowzilla." She said crews had worked all night and Sunday on plowing main roads and were just now getting to secondary roadways and neighborhoods. Public schools were closed on Monday across much of the Washington and Baltimore region, with some shuttered through Tuesday. All federal government offices will be closed on Monday and the US House of Representatives canceled its voting until Feb. 1 and the Pentagon canceled all its events. Nevertheless, walkers, sledders, some cars and the occasional cross-country skier ventured into the dazzling white under a bright sun. Paul Schaaf, a 49-year-old helicopter pilot for Children's Hospital in Washington, was biking 7-1/2 miles (12 km) to work for his overnight shift and planned to bike back to Arlington, Virginia, on Monday morning. "I have to get into work no matter what. And the best way to do it is on my bicycle with steel-studded snow tires," he said. "Nothing stops me." One Washington food store, Broad Branch Market, opened with a handful of employees, and was trying to organize volunteers to shovel the sidewalks of the elderly and others who needed help. "I have a lot of people on the list but I have yet to have any kids sign up to work today," said owner Tracy Stannard. At Dupont Circle, hundreds gathered to pelt each other with snowballs. Jomel Nichols, a tourist from Kansas City, Missouri, accompanying three exchange students and her daughter, was plastered with snow. "They all turned on me, as teenagers will do," she told Reuters Television. More than 3,900 flights were canceled on Sunday, and some 900 were called off for Monday, according to aviation website FlightAware.com. Among New York-area airports, John F. Kennedy International, Newark Liberty and LaGuardia were open, with limited flight activity expected on Sunday, the Port Authority of New York and New Jersey said. About 150,000 customers in North Carolina and 90,000 in New Jersey lost electricity during the storm but most service had been restored by Sunday afternoon.